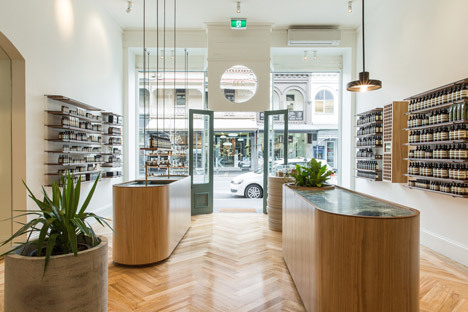 Genesin Studio has designed a pale wood and antique marble interior behind a dusky-green Victorian shopfront for skincare brand Aesop’s new Adelaide store . 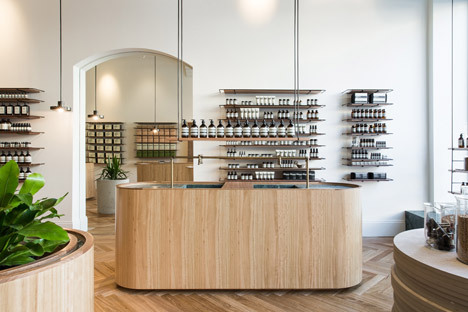 Genesin Studio created the interior for Aesop on Rundle Street – a popular shopping area within the studio’s hometown of Adelaide, South Australia. 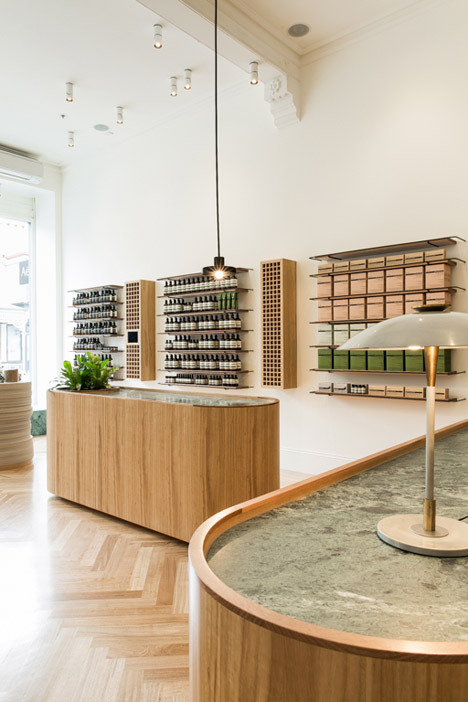 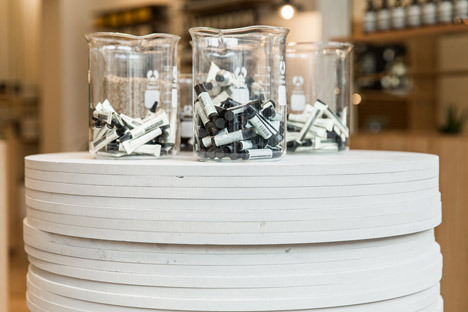 “Materials were reinvented into the space to encourage nostalgia of the site’s heritage, but also to create interesting design components to platform the Aesop shopping experience,” said studio founder Ryan Genesin. 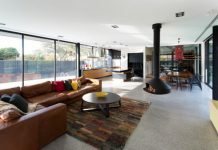 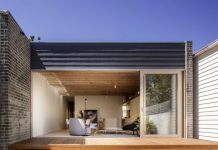 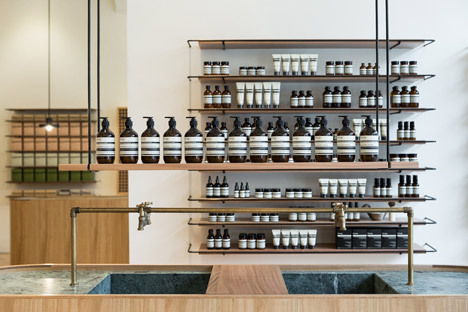 “The hard-wearing Tasmanian oak was used to display Australian timbers to international shoppers and to give longevity to the design of space with its honey tones; these tones also give the Aesop brown bottles an honest, earthy contrast,” said the architect. 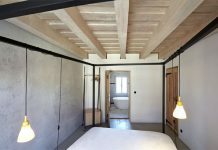 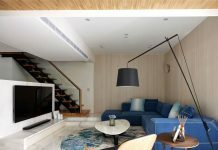 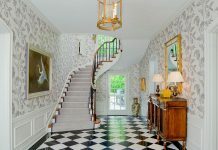 “Antique green marble was used to modestly celebrate the Victorian period of the building and to give foundation to the interiors, but detailed and applied in a contemporary way,” the architect said. 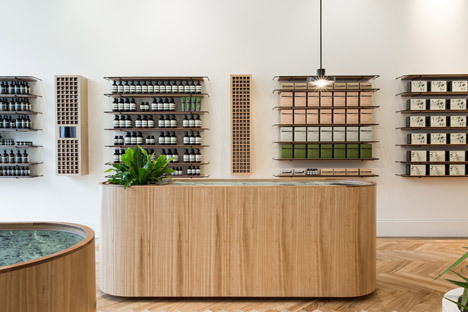 The brand’s products are displayed around the walls on rows of wooden shelves with curved metal surrounds, and on suspended shelves over the wash basin and in the shop window. 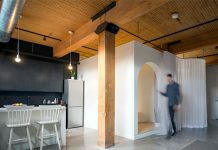 “Blackened steel rod shelving was used for its simplicity and rawness that also pays homage to the old building,” said Genesin. 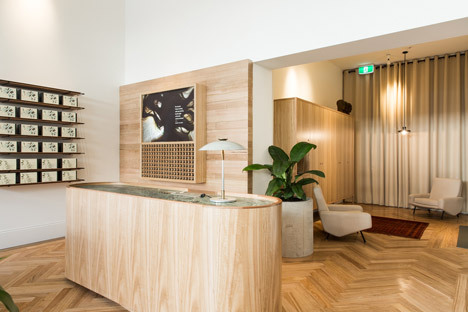 Behind the cash desk, a section of wall is clad in chunky planks of oak. 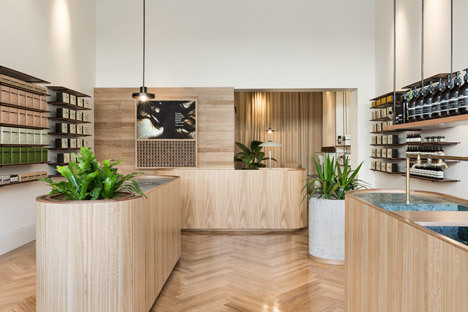 To the right, a lounge area with armchairs and beige linen curtains creates a space where customers can enjoy a coffee and browse the store’s library. 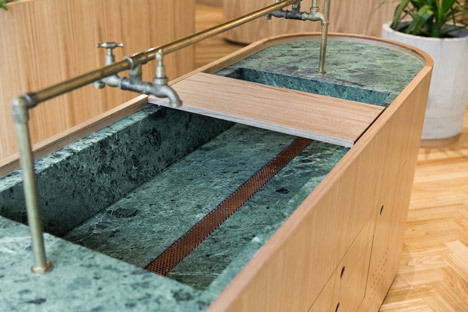 “The white space also gives emphasis to the merchandise and helps to exhibit and display without distraction, like a gallery,” said the architect. 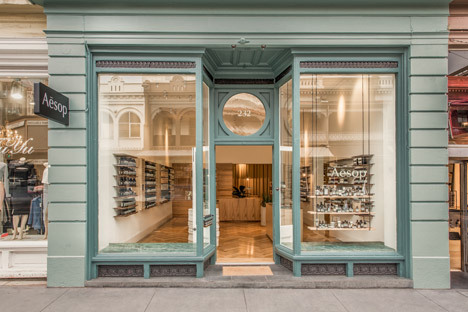 “The signature Aesop dusty green painted facade sits perfectly with the old building facade and understatedly gives Aesop street presence,” said the architect.